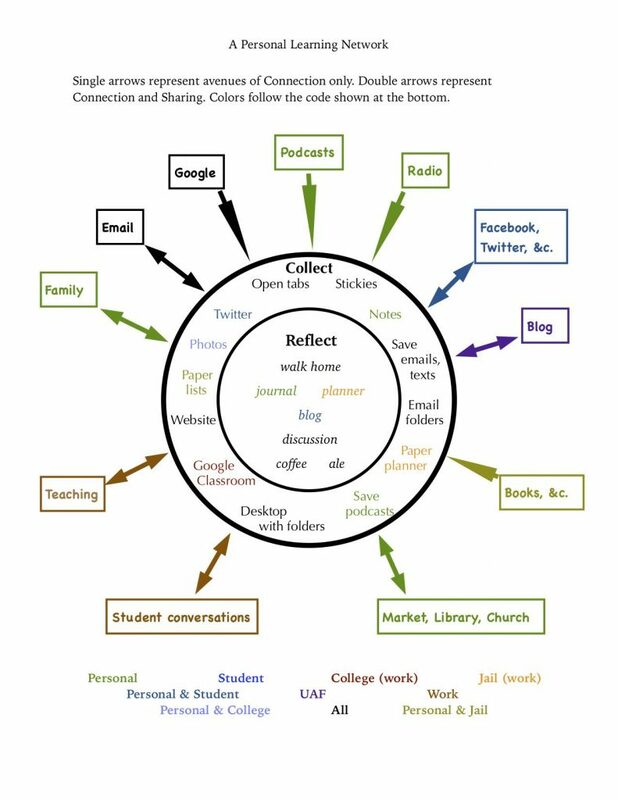 I was hoping to revisit my PLN from the beginning of the semester and find some great evolution or fulfillment, but I don’t think much has changed in the illustration I posted then. I have made some efforts toward a public PLN page on my website, but it is not ready to be published. I have also thought of two things that should have been added to the “Reflect” circle: diaper washing and music. Some of my classmates have expressed an interest in what it is I do for the University at the Kuskokwim Campus (KuC). It is not nearly as interesting as it sounds, but I will share it here. In the weeks just before Thanksgiving, our class collaborated to create an annotated bibliography of interesting and relevant sources related to teaching with web tools. Seven students, plus the instructor, worked in a shared Google Doc, all with editing privileges. For my media creation project, I created a screencast. This is something I have done many times before, but this time I used different screen capturing software and uploaded the final product using Kaltura MediaSpace. My previous videos were recorded, edited, and uploaded using Screencast-o-matic or Screencastify; for this one I used the native screen capture feature in MacOS Mojave and edited in iMovie. Always in the past, I have been in too much of a hurry to caption my videos, since they were produced on demand and students needed answers right away, so this was my first time doing that, also. My first motivation toward making my classroom paperless was concern for the environment. There is no paper recycling where I taught at the time, and the classes I taught used huge volumes of handouts. My tree hugging was not a good enough reason to change the instructional model of the institution, though, so I had to find a pedagogical justification, and find one I did. Web presence is exactly what it says it is: how one presents oneself on the Web—social media, domain of one’s own, interactions with others’ domains. It is intentional. It is not necessarily singular. For our latest assignment, our class created a Collaborative Annotated Bibliography (link goes to a shared Google Doc), for which we each contributed three articles on teaching with technology in our own context, then edited the resulting document together. Our goal was to create a list of 15-20 useful resources for each other and other educators. Here are the three articles that I contributed to the annotated bibliography. The links will take you directly to pdf files that you can download and read or read online, if you wish.